After seeing Mendocino Farms topping the Yelp list on numerous occasions, the stars must have aligned and provided the perfect opportunity. They're only open on the weekdays (downtown locations), during a small window around lunch time, which makes it kinda impossible to go. Parking is a whole other story. The sandwiches were sure delish and the tomato soup just hit the spot. I needed a new cardigan/sweater, more for warmth than anything else, which would be easy to just throw on for school. While this particular sweater wasn't exactly what I had in mind, it actually worked out perfectly in hindsight. Also, the photo of my nails were taken a few days post polish... so please excuse the not-so-perfect edges. My bf saw them and immediately said they looked like tuxedos. That led to other ideas that I might do later. 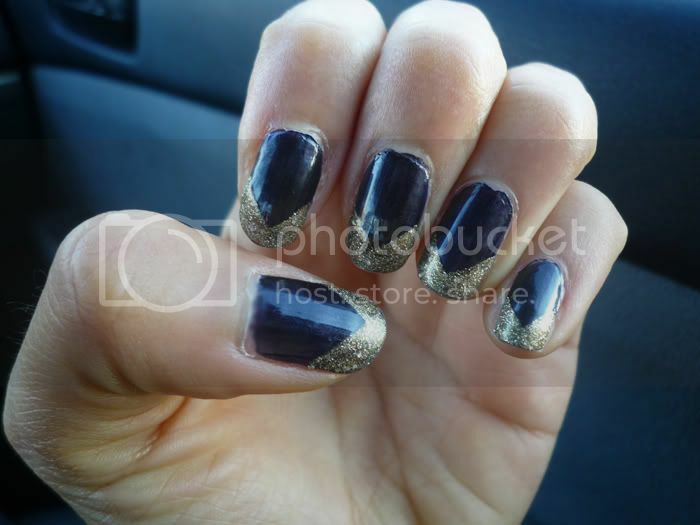 This nail design is one of the simplest ones to do and can add a punch with using very contrasting and bright colors. Simply paint diagonally one edge, and then the other. Also, a hint for removing extremely stubborn glitter nail polish (like the Looks Like Rain, Dear): take cotton pads and wet them with nail polish remover. Then, cover (wrap) your nails with the cotton pad for about 30 seconds... that should loosen up the nail polish enough to easily remove! still a little navi, I found lovely.